Mandolins first appeared in 15th century Italy as a variation of the lute and share similarities with other string instruments such as the balalaika and the Greek bouzouki. Typically, a mandolin has four sets of double strings and is played with a flat pick called a plectrum. Mandolins and instruments like them found their way to America with the first wave of Eastern and Southern European immigrants in the 1850’s, and achieved major popularity in the mid-1920’s. Early in its development, mandolin music was primarily classical in nature. Antonio Vivaldi was the best known composer for the Baroque mandolin. Ludwig van Beethoven also composed mandolin music and played the instrument himself. Throughout the succeeding centuries, the mandolin has been used in a variety of musical genres, from renaissance and folk music, classical music, country and bluegrass to jazz and rock. Bill Monroe, known as the father of bluegrass music, was a major force behind introducing the mandolin to bluegrass and country players. Rock musicians including Rod Stewart, Led Zeppelin’s Jimmy Paige, Jack White, and many other artists have incorporated the mandolin into their music. Mandolins can be divided into three categories -- bowl back, flatback, and carved archtop. Of these three, the archtop is the most popular with musicians. Archtop mandolins come in two body styles -- the teardrop “A” style and the more fancy Florentine or “F” style -- both of which were introduced in the latter part of the 19th century. The F-style has a decorative scroll near its neck, two points on the lower body and a scroll carved into its headstock vs. the A-style which is pear-shaped, has no points, and has a more simple headstock design. Both styles have two f-shaped soundholes similar to the violin, or an oval sound hole directly beneath the strings. Generally speaking, F-style mandolins are associated with bluegrass and country music while the A-style instruments are used to play musical genres such as classical, folk, Celtic, and rock. If you’re considering purchasing a mandolin, you need to know that the materials that go into making an instrument determine its quality. Spruce is the best choice of wood for constructing the soundboard due to the quality of its resonance. Solid maple is the wood of choice for the body and neck, although other hardwoods such as mahogany and koa are often used. Very hard woods such as rosewood or ebony are used for fretboards due to their smooth surfaces, which lend themselves to fast-fingered fretting. The experienced and knowledgeable luthiers at Eastman Strings produce handmade instruments from the best materials. Their craftsmanship is second to none, and the result is a beautifully made mandolin with amazing tonal quality. 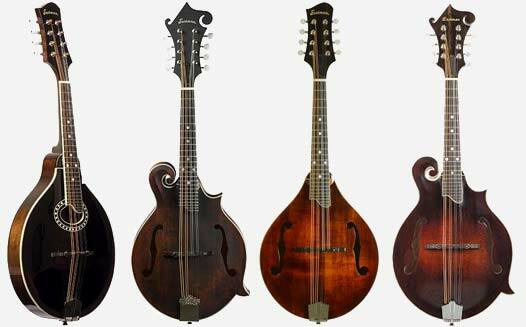 Eastman Mandolins come in two traditional body styles, the A-style and the F-style. Both are available in oval hole or f-hole models. When buying a mandolin, you need to decide on the type of mandolin that best suits you. Most mandolin players choose between the A-style or F-style. If you’re a beginner, you may want to consider starting out with the A-style which tends to be more affordable. While more expensive instruments are made from solid woods, if you’re on a budget, you can find mandolins made of laminate. However, you should try to purchase an instrument with as much solid wood in its construction as possible. Mandolin prices are based on the quality of materials that go into their construction and the additional labor required to produce them. Beginners can find a good quality mandolin crafted from solid woods with ebony fingerboards for around $500. Instruments under $500 are usually A-style laminated wood imports.